Dunboyne AC had 5 athletes in action today at rhe All Ireland Schools Cross Country in Waterford. This high calibre event brings the best secondary school distance athletes from the four provinces of Ireland together ro battle it our for national honours and international selection. Previous competitors and previous winners in this event reads like a who’s who of Irish athletics. Rain, very challenging underfoot conditions and a punishing course was the order of the day. 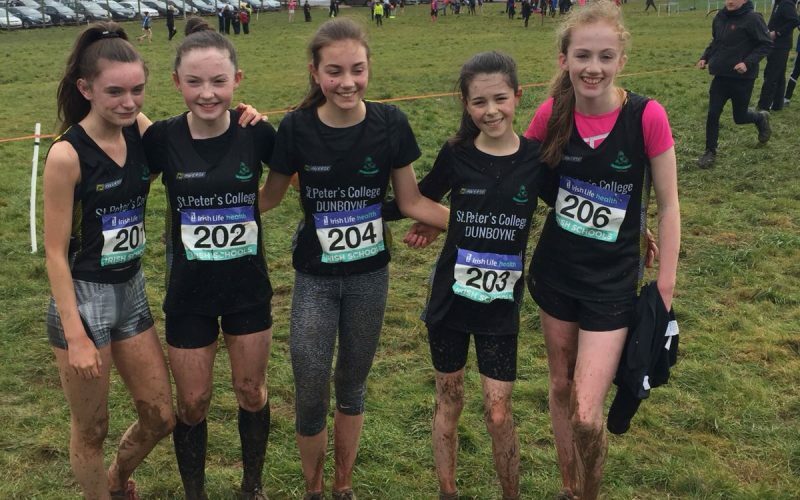 All the Dunboyne AC girls did incredibly well just to qualify for the big day today. Having sucessfully negotiated the challenging qualifers of the West Leinster XC Champs and the Leinster XC Champs to make it to these nationals the competition was fierce. St Peter’s College were unlucky not to medal in the Minor girls team competition, finishing 5th by just 7 points. Kayla Ryan ran a cracker finishing 11th overall and leading her team home. Club team mates Sophie Dolan and Rachael Norman also ran very well and they all were unlucky to finish outside the medals in the team event. Holly Conlon on the other hand, had reason to be delighted with her very good run being a key scorer on the Mount Sackville team that grabbed a well deserved Bronze medal. Illness and unavailability robbed St Peters of a full team in the Junior Girls race. Aoife McCormack was the club’s sole representative here, one of two girls representing the school. She ran very well finishing well up this talented field of athletes after a very strong performance. Well done girls on fine performances from you all in this ultra high quality elite national event. You did your schools and your club proud.